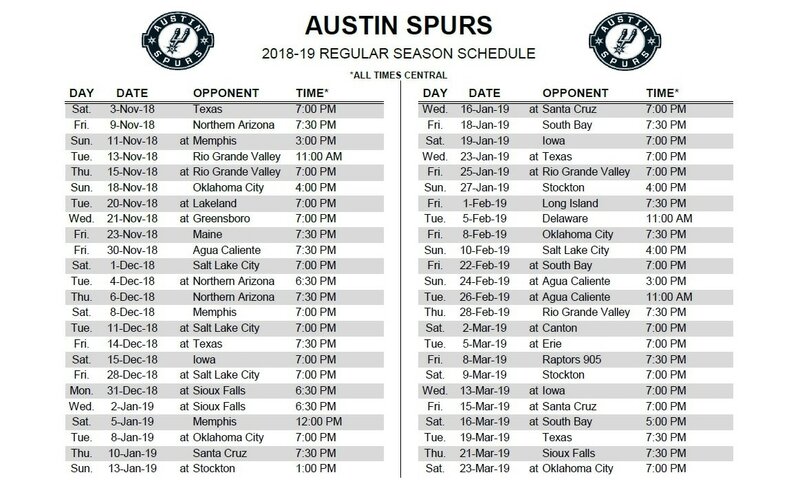 AUSTIN, TX (March 15, 2019) – The Austin Spurs, presented by SWBC, will host their final two home games of the season at the H-E-B Center at Cedar Park, beginning with their annual Youth Sports Game in celebration of NBA Fit Week on Tuesday, March 19 at 7:30 p.m. against the Texas Legends. For the season finale, the Silver and Black will host their annual Fan Appreciation Game on Thursday, March 21 at 7:30 p.m. against the Sioux Falls Skyforce. Prior to the Youth Sports game, the Austin Spurs are hosting the annual Central Texas High School All-Star Games, presented by Greater Texas Credit Union, at the H-E-B Center at Cedar Park. The top athletes from the central Texas area will team up with their respective regions to compete prior to the Austin Spurs’ game that night. The MVP of each game will receive a $250 scholarship, courtesy of Texas Orthopedics. The girls’ game will begin at 1 p.m. and the boys’ game at 2:15 p.m. A ticket guarantees entry to both games as well as the Austin Spurs game that night. On the same day, youth can enjoy an outdoor festival in the parking lot of the H-E-B Center at Cedar Park from 2:30 p.m. to 5:30 p.m. The family-friendly event that is free to enter will include inflatables on which children can play and food trucks from which fans can purchase food and beverages. At the Fan Appreciation Game, free team posters will be handed out to the first 500 people who enter the arena. Items from Austin Spurs sponsors will be given out to lucky fans throughout the night. After the game, the entire Austin Spurs roster will be available to sign autographs. To purchase tickets or find more information regarding both games, call the Austin Spurs office at (512) 236-8333 or go to austinspurs.com.